On Thursday, Hamas said that it had allocated new apartment homes funded by Iran in the Gaza Strip to Palestinian former prisoners who had been held in Israeli jails. Why are the Iranians paying for apartments in a little coastal enclave of two million people on the other side of the Middle East? For the same reason that Iran's supreme leader, Ayatollah Ali Khamenei, recently said that the Islamic Republic cannot give up its "divine duty" to support Palestinians and that their "final victory … will be realized" in the "not-so-distant future": the Islamic Republic seeks Israel's destruction and views the Palestinians as an effective vehicle through which to achieve that goal. Moreover, Iran supports the Palestinians, especially Hamas, to expand its regional influence. It is no secret that opposing Israel is fundamental to the Islamic Republic's ideology, driving many decisions of Iranian foreign policy. Earlier this year, for example, Khamenei called Israel a "cancerous tumor" that must be "removed and eradicated." Iran's support for the Palestinians goes far beyond rhetoric, however. Indeed, Iran transfers weapons and $70 million each year to Hamas and another $30 million to Palestinian Islamic Jihad, another terrorist group. This support only scratches at the surface of the Iranian-Palestinian relationship. Both sides have worked together for decades, even before the Iranian Revolution of 1979. Tony Badran, a fellow at the Foundation for Defense of Democracies, details this important history in a new, must-read article for Tablet magazine. One of the more interesting details that may surprise some readers is that the Palestine Liberation Organization and its late former chairman, Yasser Arafat, played integral roles in the formation of Iran's Islamic Revolutionary Guard Corps. But Arafat and the PLO's involvement did not stop there. Three figures in particular from that camp were active in Lebanon, working closely with the PLO [including] … Mohammad Montazeri, son of senior cleric Ayatollah Hossein-Ali Montazeri, and a militant who had a leading role in developing the idea of establishing the Islamic Revolutionary Guard Corps once the revolution was won. The Lebanese terrorist and PLO operative Anis Naccache … takes personal credit for the idea. Naccache claims that Jalaleddin Farsi [a Khomeinist] approached him specifically and asked him directly to draft the plan to form the main pillar of the Khomeinist regime. 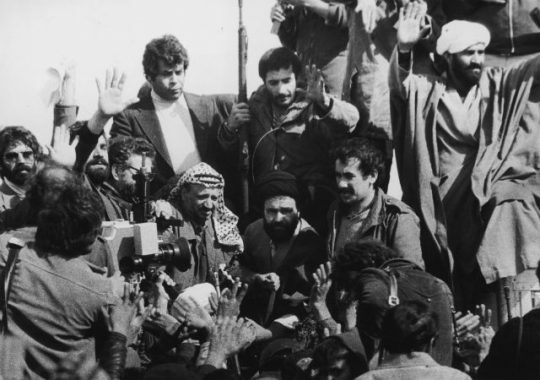 Badran also describes how Arafat "saw a chance to play the middleman between Iran and the Arabs, and to encourage them to eschew conflict with each other in favor of supporting the Palestinians in their fight against Israel." But Arafat's attempt to play at politics, along with various efforts to meddle in Iranian affairs and the onset of the Iran-Iraq War, doomed the relationship (although Arafat asked years later for weapons to use against Israel). his wish to see Iran back the Palestinian armed struggle is now a fact, as Tehran has effectively become the principal, if not the only, sponsor of the Palestinian military option though its direct sponsorship of Islamic Jihad and its sustaining strategic and organizational ties with Hamas. Badran's piece is not only fascinating, but also important to help understand Iran's support for the Palestinians today. This long and complicated history helped forge a relationship out of shared hate—hate for Israel. There have been many ups and downs in the relationship over the years, but that antipathy has always drawn them back together. The Palestinians need support to fight a more powerful enemy, and Iran needs proxies so it does not have to send its soldiers to the front lines. The Iranian-Palestinian relationship should be a clear sign that an independent Palestinian state, were it ever to come to fruition, would almost inevitably become, to some extent, a vassal to Iran, serving the interests of the Islamic Republic. Western leaders should keep this in mind when they consider ambitious steps to move toward a two-state solution. Badran's article also serves as an important reminder. When one reads about how Iran's aggression in the Middle East causes so much chaos, remember that the Palestinians helped build that machine of war, more than four decades ago. This entry was posted in National Security and tagged Gaza, Hamas, Iran. Bookmark the permalink.